In the development of remote offshore oil or gas fields with minimal or no infrastructure such as those in deepwater Brazil, West of Africa and Western Australia regions, the Floating Production Storage and Offloading (FPSO) vessel is the preferred option. The FPSO has the advantage of providing the required storage in the hull and direct offloading to tankers of opportunity. Steel Catenary Risers (SCRs) are the preferred solution in wet-tree applications due to their simplicity, robustness and low Capital costs (CAPEX) and Operational costs (OPEX) compared to other riser options. However, due to its relatively high dynamic motions, FPSO is not a feasible host for SCRs in most environments. Also, for efficient production from rich reservoirs, large diameter and a large number of risers are typically required. This makes it more challenging to find a robust and commercially attractive riser solution with conventional FPSOs. TTRs for dry-tree well completion have their well-established technical and economic advantages in allowing Direct Vertical Access (DVA) to production wells and hence enhanced recovery. However, due to the stroke limitation of the existing qualified tensioner technologies, the use of TTRs requires a floating system that provides minimal heave response and therefore cannot be hosted on FPSOs. In dry tree applications when storage is required, a wellhead platform is typically used along with an FPSO which adds significant CAPEX and OPEX to the overall field development cost. The sail area of the conventional ship-shaped FPSO in relatively harsh and multi-directional environments mandates the use of turret system to help facilitate the mooring system design. The turret cost normally ranges from $300MM USD to $700MM USD. The CAPEX and OPEX associated with the turret imposes additional high cost to the overall field development. 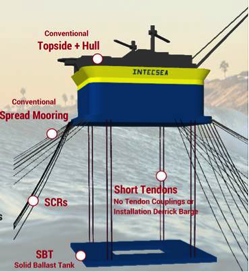 The LM-FPSO is an ingenious design that is developed to maintain the advantages of the conventional FPSOs while offering superior motion response suitable for SCRs and TTRs in very harsh environments; even with the presence of persistent swells, to significantly reduce the overall field development CAPEX and OPEX. The shape of the LM-FPSO hull allows the use of a conventional mooring system and eliminates the need for the expensive turret and swivel system and their associated OPEX. As a by-product of the superior motion response, the LM-FPSO offers improved process safety, helicopter operability and onboard habitability. The LM-FPSO by design also offers significantly improved stability and hence less sensitive to weight and VCG variation that historically has been one of the highest risk elements to the project execution cost and schedule. The LM-FPSO design is a robust and low-tech solution that is made of field-proven components that have been in service for more than twenty years (Figure 1). 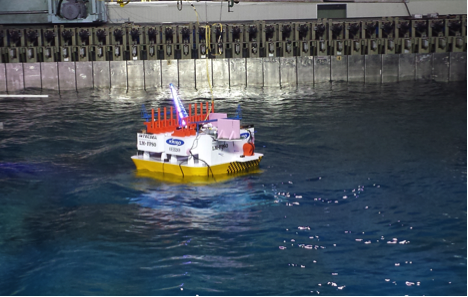 The superior performance of the LM-FPSO (Figure 2) has just been confirmed by a five-week comprehensive model testing program at the Korean Research Institute for Ships and Ocean Engineering (KRISO) (Figure 3). The test has been completed on November 18th, 2016. The design is now approaching a “Project Ready” status. Over the past few years, the LM-FPSO has been applied to a number of fields in different hydrocarbon producing regions. The design has demonstrated an economic advantage in all the regions, whether in wet or dry tree applications. The CAPEX savings are found to be between $500MM USD and $1.2 Billion USD over the alternative conventional designs.